Showers likely, mainly after midnight. Mostly cloudy, with a low around 46. Breezy, with an east wind 15 to 17 mph, with gusts as high as 24 mph. Chance of precipitation is 60%. New precipitation amounts of less than a tenth of an inch possible. Scattered showers. Partly sunny, with a high near 68. 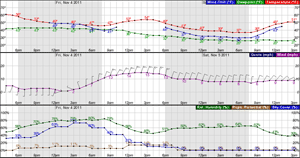 Breezy, with an east wind around 16 mph, with gusts as high as 22 mph. Chance of precipitation is 50%. New precipitation amounts of less than a tenth of an inch possible. Showers likely, mainly after midnight. Mostly cloudy, with a low around 46. Breezy, with an east wind around 15 mph, with gusts as high as 21 mph. Chance of precipitation is 70%. New precipitation amounts of less than a tenth of an inch possible. Showers likely, mainly before noon. Partly sunny, with a high near 68. East wind 9 to 14 mph, with gusts as high as 18 mph. Chance of precipitation is 60%. New precipitation amounts of less than a tenth of an inch possible. Showers likely. Mostly cloudy, with a low around 46. Breezy, with an east southeast wind around 15 mph, with gusts as high as 21 mph. Chance of precipitation is 70%. New precipitation amounts of less than a tenth of an inch possible. Showers likely, mainly before noon. Mostly cloudy, with a high near 69. East wind 9 to 14 mph, with gusts as high as 18 mph. Chance of precipitation is 70%. New precipitation amounts of less than a tenth of an inch possible. Showers likely. Mostly cloudy, with a low around 44. Southeast wind around 9 mph. Chance of precipitation is 70%. Showers likely. Mostly cloudy, with a high near 69. Southeast wind 5 to 8 mph becoming calm. Chance of precipitation is 70%. Showers likely. Mostly cloudy, with a low around 44. South wind around 6 mph. Chance of precipitation is 70%. Showers likely. Mostly cloudy, with a high near 70. South southeast wind around 5 mph becoming calm in the morning. Chance of precipitation is 70%. Showers likely. Mostly cloudy, with a low around 43. Calm wind. Chance of precipitation is 70%. Showers likely. Partly sunny, with a high near 70. Calm wind. Chance of precipitation is 60%. Showers likely. Mostly cloudy, with a low around 43. Light and variable wind. Chance of precipitation is 60%. Showers likely. Partly sunny, with a high near 70. Light and variable wind. Chance of precipitation is 70%.